Candice Breitz, I’m Your Man (A Portrait of Leonard Cohen), 2017. Installation view Anna Schwartz Gallery (downstairs), 30 January – 3 March 2018. Photography: Zan Wimberley. Courtesy the artist and Anna Schwartz Gallery. Candice Breitz, I’m Your Man (A Portrait of Leonard Cohen), 2017. Installation view Anna Schwartz Gallery (downstairs detail), 30 January – 3 March 2018. Photography: Zan Wimberley. Courtesy the artist and Anna Schwartz Gallery. Candice Breitz, Wilson Must Go, 2016, 7-channel high definition video, sound. (a) Alec Baldwin and Julianne Moore, 73 min 42 sec; (b) Shabeena Francis Saveri, 218 min 49 sec; (c) Mamy Maloba Langa, 255 min 35 sec; (d) Sarah Ezzat Mardini, 167 min 52 sec; (e) Farah Abdi Mohamed, 212 min 19 sec; (f) José Maria João, 207 min 57 sec; (g) Luis Ernesto Nava Molero, 229 min 58 sec. Commissioned by the National Gallery of Victoria, Melbourne, Outset Germany, Berlin and Medienboard Berlin-Brandenburg. Purchased with funds donated by Grace and Brendan O’Brien. Bob Marley. Sarah Ezzat Mardini. Michael Jackson. José Maria João. Madonna. Mamy Maloba Langa. Alec Baldwin. Shabeena Saveri. Julianne Moore. Luis Nava Molero. Leonard Cohen. Farah Abdi Mohamed. These recognisable and not-so-recognisable names are diverse and disparate, but one thing that brings them together is South African artist Candice Breitz. Nigerian author Chimamanda Ngozi Adichie, whose work also grapples with the issues of identity, culture and representation, discussed the importance of stories in a 2009 speech. “Stories matter. Many stories matter. Stories have been used to dispossess and to malign, but stories can also be used to empower and to humanise,” she said. “Stories can break the dignity of a people, but stories can also repair that broken dignity.” Breitz is a storyteller who uses her skills, and privilege, to amplify voices that often go unheard, and to help empower and repair dignity. Breitz primarily works in video and photography, and she rose to prominence with her 2005 work, Legend (A Portrait of Bob Marley). This was the first of her ‘portrait’ works, an ongoing study on how identity develops in tandem with celebrity. 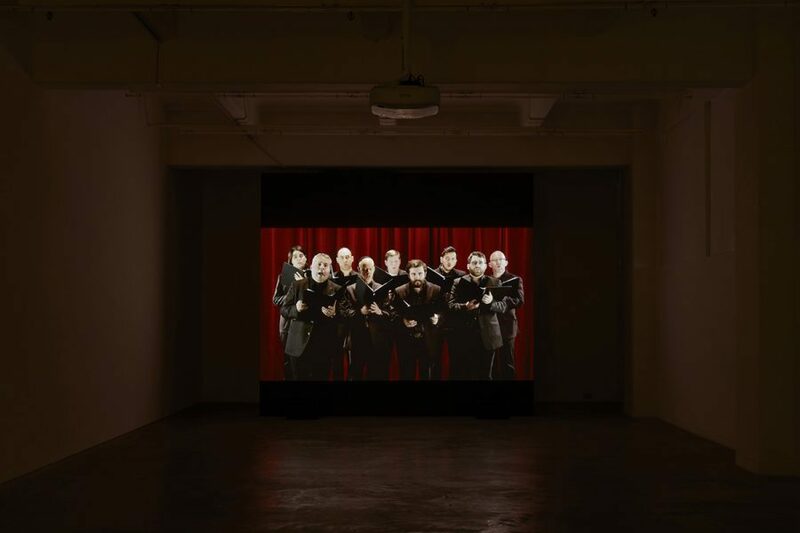 The other works in this series include: King (A Portrait of Michael Jackson), 2005; Queen (A Portrait of Madonna), 2005; Working Class Hero (A Portrait of John Lennon), 2006; and most recently, I’m Your Man (A Portrait of Leonard Cohen), 2017, which will be shown at Anna Schwartz Gallery in Melbourne from 30 January. In 2017 she represented South Africa at the 57th Venice Biennale, alongside Mohau Modisakeng, exhibiting her work Love Story, a seven-channel video installation. This piece, with its title changed to Wilson Must Go, iscurrently on show in the Triennial at the NGV. Wilson Must Go, a response to the refugee crisis, seems to signal a shift towards a more political sphere. This motivation is evident in Breitz’s social media presence. Her public Facebook, and more recently Instagram, posts are full of political and cultural commentary. On 12 December 2017, Breitz published a post titled “Why I’m Sabotaging My Own Work” to explain her decision to change the title of Love Story to Wilson Must Go. 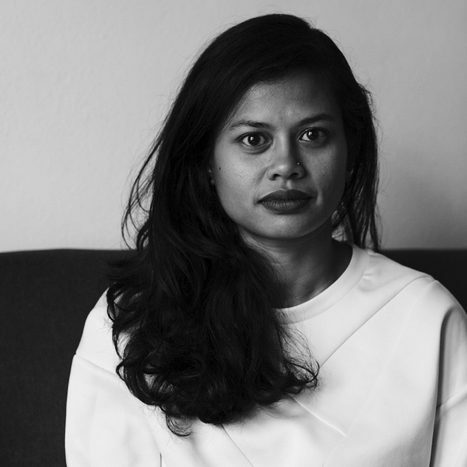 “While I am grateful for the immense support I have received from the NGV, it would be morally remiss, in light of the above knowledge [of Wilson Security’s role in offshore detention centres], for me to remain silent in the context of the current conversation that is taking place around the Australian government’s ongoing and systematic abuse of refugees,” she wrote. Looking back on her career, Breitz has always broached complex and challenging topics in her work. Gender, identity, feminism, race and class are just some of the things she addresses, sometimes aided by the use of star power. Wilson Must Go, for example, stars Alec Baldwin and Julianne Moore. “Alec, people will listen to you, you’re famous,” Baldwin reflexively says to himself at one point in Wilson Must Go. 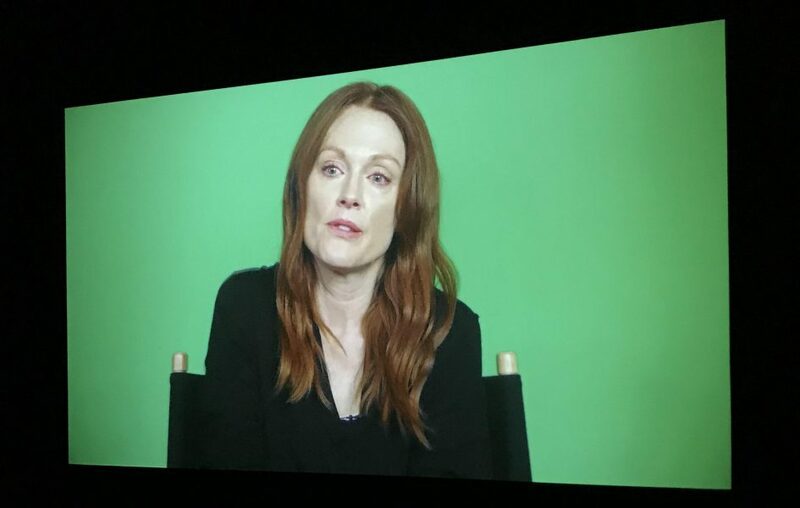 The screen then cuts to the equally famous Julianne Moore. 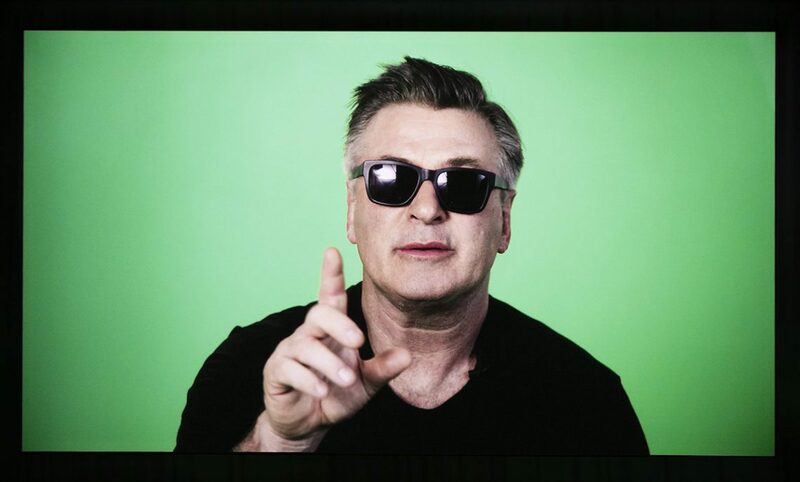 Viewers are held captive by the power of cinema and celebrity as Baldwin and Moore speak in turns before a green screen. The narrative is disjointed, Breitz edited the a dialogue into a montage to remove context. Confusion lifts in the second, smaller room of Breitz’s installation at the NGV where interviews with six refugees are presented in their entirety. It’s a more intimate setting. In place of the cinema screen are six smaller screens and headphones. The stories told by refugees Sarah Ezzat Mardini from Syria, José Maria João from Angola, Mamy Maloba Langa from the Democratic Republic of Congo, Shabeena Francis Saveri from India, Luis Ernesto Nava Molero from Venezuela, and Farah Abdi Mohamed from Somalia are what Baldwin and Moore are reciting verbatim, but heavily edited, on the big screen. Breitz asks on her website, “What kind of stories are we willing to hear? What kind of stories move us? Why is it that the same audiences who are driven to tears by fictional blockbusters remain affectless in the face of actual human suffering?” The six interviews with refuges go on for hours, no detail of each harrowing and perilous journey of seeking asylum spared. A few viewers who were transfixed by Baldwin and Moore circle quickly through the second room. Wilson Must Go, in its entirety, is overwhelming and begs empathy from viewers. But do we have the attention span (or stomach) for it? This is the crux of the work. As a storyteller, Breitz is able to eke out nuances of personality and identity in her subjects. This is true even in works that appear to be light hearted on the surface, such as I’m Your Man (A Portrait of Leonard Cohen), because Breitz sees the value in all stories and all characters. Candice Breitz, I’m Your Man (A Portrait of Leonard Cohen), 2017. Installation view Anna Schwartz Gallery (upstairs), 30 January – 3 March 2018. 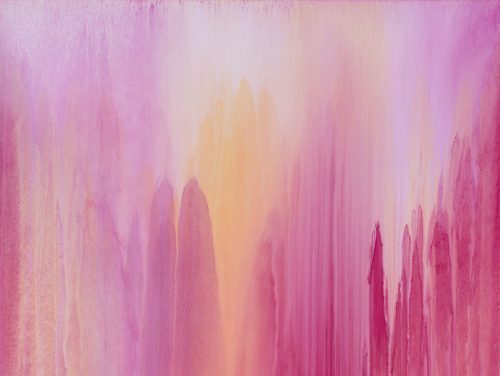 Photography: Zan Wimberley.Courtesy the artist and Anna Schwartz Gallery. 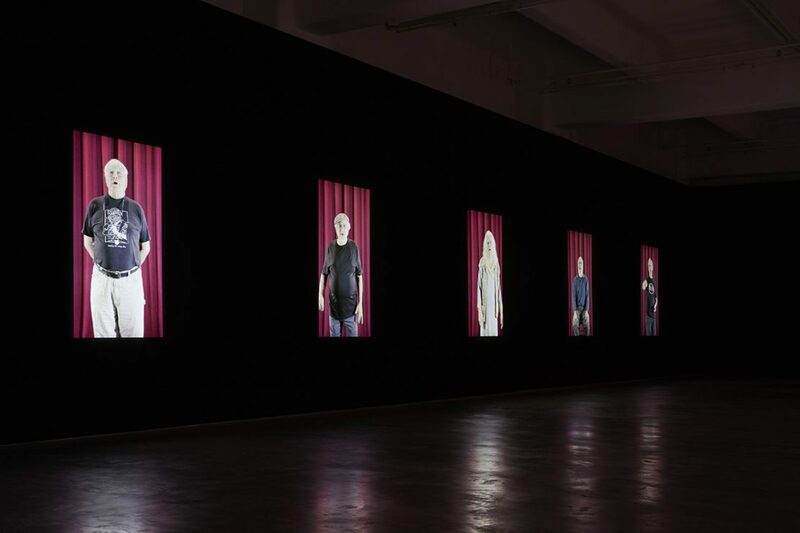 Commissioned by the Musee d’Art Contemporain in Montreal (Cohen’s hometown) for the 2017 exhibition Leonard Cohen – Une brèche en toute chose (A Crack in Everything), the work is really a close to life-sized portrait of 18 diehard Leonard Cohen fans. It tells the story of a particular section of Cohen fandom through performance. 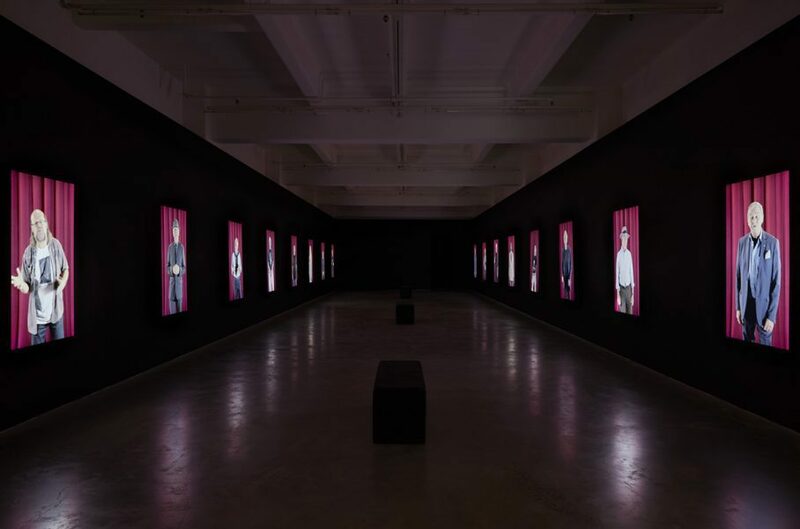 All the men featured in the installation are of Cohen’s generation, and live in Cohen’s beloved city. “I was a Leonard Cohen fan since I was 17,” one man says. As these men sing their way through Cohen’s 1988 album, their earnestness, individual style and mannerisms meld together, revealing a sense of community and belonging. It’s a special shared bond, similar to the process by which refugees are bonded by very different, but ultimately shared, experiences. In 1992 Leonard Cohen released an album titled The Future, which features a song titled Anthem. In it Cohen sings, “There is a crack, a crack in everything. That’s how the light gets in.” It’s a message of hope for the future. We need storytellers like Breitz, now more so than ever, to help reveal the cracks, to shine a light where it is needed, to give voice to those who can’t speak so we can listen. The world will be richer for it. 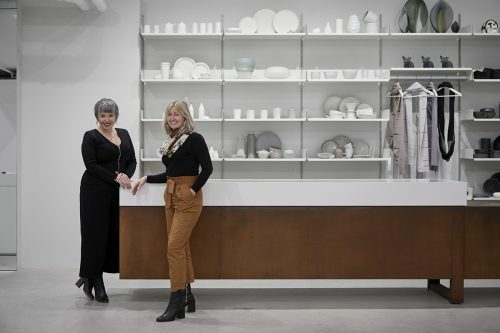 Melissa King became CEO of Craft Victoria in July 2017. Prior to joining the organisation, King was working with the New Zealand Symphony Orchestra.